Sustainable development sits at the convergence of three factors: social, economic, and environmental. Sustainable development is defined as balancing the protection of the natural environment with the fulfillment of human needs so that these needs can be met not only in the present, but in the indefinite future. The term has prompted a global recognition of the close linkage between environmental health and human development, as well as the need to alter social and economic policies to minimize the human impact on the planet. First coined in 1980 by the International Union for the Conservation of Nature, "sustainable development" came into general usage following publication of the 1987 report of the Brundtland Commission. The commission’s oft-quoted definition casts sustainable development as economic and social growth that "meets the needs of the present without compromising the ability of future generations to meet their own needs" (United Nations Department of Economic and Social Affairs 1987). The concept of sustainable development integrates social, economic, and environmental policy. It considers both development (a traditional economic and political goal) and sustainability (an ecological goal). Several United Nations texts, most recently the 2005 World Summit Outcome Document, refer to the "interdependent and mutually reinforcing pillars" of sustainable development as economic development, social development, and environmental protection. Despite the possible conceptual and practical limitations of the term, its impact on the global conversation must also be emphasized. Sustainable development signals a shared belief that there are ultimate, biophysical limits to human growth. As established by the Brundtland Commission's definition, sustainable development is not an issue limited to national borders, but one involving the entire human community. The Brundtland Commission, formally the World Commission on Environment and Development (WCED), is known by the name of its chair Gro Harlem Brundtland. The commission was created in 1983 to address growing concern "about the accelerating deterioration of the human environment and natural resources and the consequences of that deterioration for economic and social development." In establishing the commission, the United Nations General Assembly recognized that environmental problems were global in nature and determined that it was in the common interest of all nations to establish policies for sustainable development (United Nations Division for Sustainable Development 2005). The Universal Declaration on Cultural Diversity (UNESCO, 2001) elaborates the concept further by stating that "...cultural diversity is as necessary for humankind as biodiversity is for nature”; it becomes “one of the roots of development understood not simply in terms of economic growth, but also as a means to achieve a more satisfactory intellectual, emotional, moral and spiritual existence." In this vision, cultural diversity is the fourth policy area of sustainable development. Some research activities start from this definition to argue that the environment is a combination of nature and culture. The Network of Excellence "Sustainable Development in a Diverse World," which is sponsored by the European Union, works in this direction. It integrates multidisciplinary capacities and interprets cultural diversity as a key element of a new strategy for sustainable development. Some people now consider the term "sustainable development" to be too closely linked with continued material development; they prefer to use terms like "sustainability," "sustainable prosperity," or "sustainable genuine progress" as the umbrella terms. Many environmentalists have criticized some interpretations of the term "sustainable development" as an oxymoron, claiming that economic policies based on concepts of growth and continued depletion of resources cannot be sustainable, since that term implies that resources will remain constant. The differences in the conception of sustainable development stem in part from tensions between economic and ecological values. Green development is generally differentiated from sustainable development in that the former prioritizes what its proponents consider to be environmental sustainability over economic and cultural considerations. However, proponents of sustainable development argue that it provides a context in which to improve overall sustainability, whereas cutting-edge green development is not always attainable. For example, a modern treatment plant with extremely high maintenance costs may not be sustainable in regions of the world with fewer financial resources. An environmentally ideal plant that is shut down due to bankruptcy is obviously less sustainable than one that is maintainable by the indigenous community, even if it is somewhat less effective from an environmental standpoint. Thus, a distinction between different degrees of sustainability should be made. The debate currently focuses on the sustainability of the environment and the economy, which can in other words be considered as a relationship between natural capital (the sum total of nature's resources) and manufactured or man-made capital. Weak sustainability is advocated by Hartwick's Rule, which states that as long as total capital stays constant, sustainable development can be achieved. In other words, as long as the diminishing natural-capital stocks are being substituted by gains in the man-made stock, total capital will stay constant and the current level of consumption can continue. The proponents of weak sustainability believe that economic growth is beneficial, as increased levels of income lead to increased levels of environmental protectionism. This approach is also known as the substitutability paradigm. Conversely, supporters of strong sustainability, such as Herman Daly, believe that natural capital and man-made capital are only complementary at best. In order for sustainable development to be achieved, natural capital has to be kept constant independently from man-made capital. This model is known as the non-substitutability paradigm. What is being revised under the strong model of sustainable development is a definition of nature in which nature is not reduced to a passive instrument, understood only in terms of its usefulness for humans. Dealing transparently and systemically with risk, uncertainty, and irreversibility. Ensuring appropriate valuation, appreciation, and restoration of nature. Integration of environmental, social, human, and economic goals in policies and activities. Equal opportunity and community participation/Sustainable community. Conservation of biodiversity and ecological integrity. Recognizing the global integration of localities. A commitment to best practice. No net loss of human capital or natural capital. The principle of continuous improvement. The need for good governance. 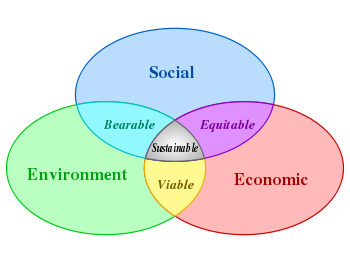 Sustainability can be defined both qualitatively, as an ethical/ecological proposition such as that offered by the Bruntland definition, and quantitatively in terms of system-life expectancy and the trajectory of certain factors or terms in the system. Quantitative analysis typically uses system dynamics modeling, as systems are often non-linear. Important human ecological sub-systems that could be analyzed or modeled in this way might include the nitrogen cycle in sustainable agriculture or the depletion of oil reserves. The Natural Step/System Conditions of Sustainability. Following the Brundtland Commission's report, one of the first initiatives to bring scientific principles to the assessment of sustainability was made by Swedish cancer scientist Karl-Henrik Robèrt. At the core of the process lies a consensus on what Robèrt came to call the natural step framework. In the natural step framework, a sustainable society is one that does not systematically increase concentrations of '"substances extracted from the earth's crust" or "substances produced by society," that "does not degrade the environment," and in which people have the "capacity to meet their needs worldwide" (TNS Canada 2007). Life Cycle Assessment. A "composite measure of sustainability" that analyzes the environmental performance of products and services through all phases of their life cycle, from processing raw materials to re-use and recycling (Canadian Architect 2007). Ecological footprint analysis. An estimate of the amount of land area that a human population, given prevailing technology, would need if its current resource consumption and pollution is matched by its sustainable (renewable) resource production and waste assimilation. One of the striking conclusions to emerge from ecological footprint analyses is that four or five back-up planets engaging in nothing but agriculture would be required for all those alive today to participate in a Western lifestyle. Baker, S. 2006. Sustainable Development. New York, NY: Routledge. ISBN 041528211X. Canadian Architect. 2007. Measures of sustainability Canadian Architect. Retrieved December 23, 2007. TNS Canada. 2007. System conditions The Natural Step. Retrieved December 23, 2007. United Nations Department of Social and Economic Affairs. 1987. Report of the World Commission on Environment and Development United Nations. Retrieved December 23, 2007. United Nations Division for Sustainable Development. 2005. Sustainable development issues United Nations. Retrieved December 23, 2007. All links retrieved November 5, 2015.
International Institute for Sustainable Development International non-profit organization for sustainable development. This page was last modified on 6 November 2015, at 00:02.